While not officially announced from Sony corporate, I have been able to confirm via a Sony Store and multiple calls to Sony's sales number that Sony has stopped producing their Sony Internet TV with the built-in Google TV platform. Over the past few weeks I've been noticing that Sony's Google TV model has disappeared from nearly all supply channels and Sony's own website now lists the 24", 32" and 46" models as "no longer available". Sony has a few of the 40" models left, discounted down to $599, and only a handful of refurb units. Retailers like Amazon who use to sell these direct are out of all models and are only selling them via third party sellers who combined, have a total of 13 units left in inventory. As a result, prices on these TVs have shot up with many asking $900 for a 40" model that most recently sold for $599. And the few 24" models that I have located on eBay or other third party sites are asking $500 for a TV that use to cost $295. Sales reps at Sony that I spoke to said the TVs never sold very well and they were quick to suggest buy a TV with Sony's connected TV platform instead. Last week at CES, Sony announced a new stand alone Blu-ray box that will come with the Google TV platform, due to ship later this summer. While Sony didn't announced any new TV models that would ship with the Google TV platform baked in, they never mentioned that they are no longer producing their line of Internet TVs with Google. The news really isn't surprising considering there has been a lot of hype around Google TV, but so far, very few TV manufactures seem to really be backing it. At CES, Google mentioned Samsung as a new partner on their website yet Samsung didn't do any media outreach at all promoting the Google TV platform on their devices. At the same show, LG only announced two models that will support Google TV baked in and Vizio three models. For all the talk in the industry about how consumers don't need stand-alone boxes and want TVs to be smarter, with more platforms, it looks as if the TV industry doesn't want to allow Google to become the dominant platform. They are all competing with Google for their own connected TV software and it's clear they see the Google TV platform as a threat. Frankly, I think this is a shame as I like choice in the market. 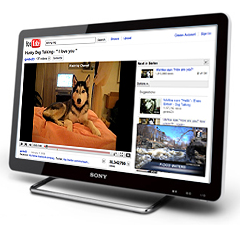 I have a few of the Sony Internet TVs with Google TV and with the launch of version two of the Google TV platform, the unit works quite well. A big part of Sony's problem was that they charged far too much for these TVs when they launched in the market. Trying to charge $599 for a 24" TV just because it had the Google TV platform, which was in beta, was a bad idea. Over the course of last year, Sony slashed prices on the TVs twice and really only started selling their inventory when they were priced 40% cheaper. In December, during an on-stage interview at the Le Web show, Google's executive chairman Eric Schmidt said that "by the summer of 2012, the majority of the Televisions you see in the Televisions stores will have Google TV embedded in it." Not sure what he was referring to there as so far, between LG, Vizio and Samsung, combined those companies have only announced a total of five models that will have the Google TV platform embedded in them. To date, none of them have said when they will come out or how much they will cost, but considering the sets are all at least 47" in size and also have 3D functionality, they won't be cheap. So if you're looking for new set under 47" in size with the Google TV platform embeeded, it doesn't look like that's going to happen any time soon, if ever.